Marilyn Monroe may have famously sung, “But square cut or pear shaped, these rocks don’t lose their shape.” And while undoubtedly true, when it comes to engagement rings you can tell a lot about a woman from the one she has surreptitiously chosen (or that her fiancé has chosen for her). A traditionalist might go for a single white diamond on a platinum band, while someone who fancies herself a little more boho might favour a warmer tone like rose gold, with a more intricate or bespoke pattern or even opt for a one-of-a-kind vintage find. And while most engagement ring buyers still favour classic, white diamonds, there are those who prefer coloured diamonds or gemstones like rubies, sapphires and emeralds. Besides the style of ring, another aspect of any engagement ring to consider is the cut of the centre stone. Again while more rounded shapes like round, cushion or oval diamonds and brilliant cuts might be the safer bet, angular shapes are now taking centre stage. Emerald and princess-cut diamonds, in particular, are trending thanks to Jennifer Lopez’s engagement ring making its debut on Instagram. Given to her by fiancé Alex Rodriguez, the ring was reportedly purchased from London jeweller Samer Halimeh for an alleged £3.8 million (about S$6.4 million). Lopez, whose previous engagement rings included a pink diamond stone flanked by two baguette-shaped diamonds from ex-fiancé Ben Affleck, and a blue diamond from former husband Marc Anthony (both from Harry Winston), appears to prefer radiant or emerald shapes when it comes to her bling. And there’s definitely a Jennifer Lopez effect when it comes to what women are buying or asking for, with the demand for pink diamonds reportedly rising circa 2002 when her ring from Affleck was first unveiled. Azfal Imram, the principal designer and co-founder of local jewellery brand State Property, which makes bespoke engagement rings along with its main line, says there has been a shift in the kinds of diamond cuts customers are going for. “I would say there has definitely been a departure from the more common brilliant or cushion cut diamonds in our bespoke projects. People seem to be looking for something different from what they see everywhere, and as a result, they become more adventurous in their choice of cuts. We have an increasing number of requests for quite a few emerald-cut diamonds. A dark horse at the moment is the marquise-cut diamond. It’s not as commonly requested, but when we do suggest it to some of our clients, they have been very receptive,” says Azfal. 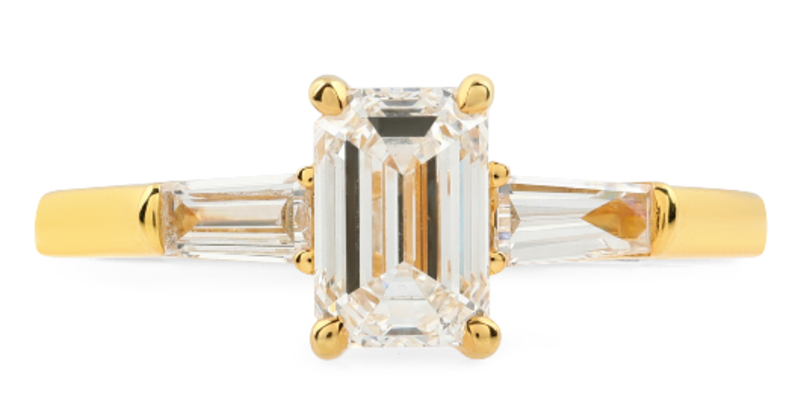 Bespoke ring by State Property featuring an emerald-cut diamond. When it comes to less traditional diamond or stone cuts, there are no clear indicators as to which kinds of customers would appreciate them more. “Generally, the clients that come to us [at State Property] are already searching for something outside the norm. And I think, in this same spirit, they also request alternatives to the usual brilliant-cut diamond solitaire ring,” says Azfal. He feels that the move towards more unique shapes and designs is due to a greater love for design, that naturally extends to an object as personal as an engagement ring. “Perhaps it’s due to people appreciating design more, as well as this movement towards customisation and expressing individuality through their purchases. But from our experience at State Property, there’s no clear group/type of client that the less traditional diamond shapes appeal to more. We’ve had requests across the board, from the younger group of clients to the older and more experienced shoppers,” says Azfal. 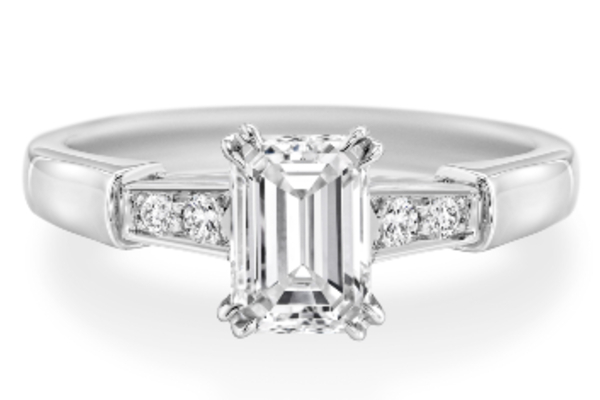 The Classic Winston ring from Harry Winston. 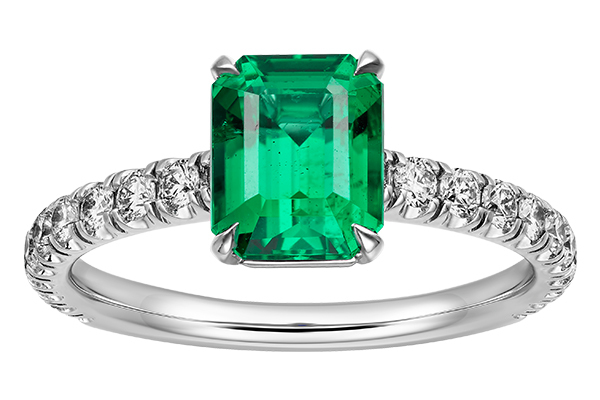 For acclaimed jewellery houses like Harry Winston, emerald shaped rings are part of the brand’s heritage. The Classic Winston ring with an emerald-cut centre stone, features tapered baguette side stones that play up the clean and elegant lines of the main stone. This ring design appears somewhat similar to Lopez’s ring from Affleck. Harry Winston also has a Tryst ring that features an emerald-cut centre stone, with two round diamonds flanking it on either side. 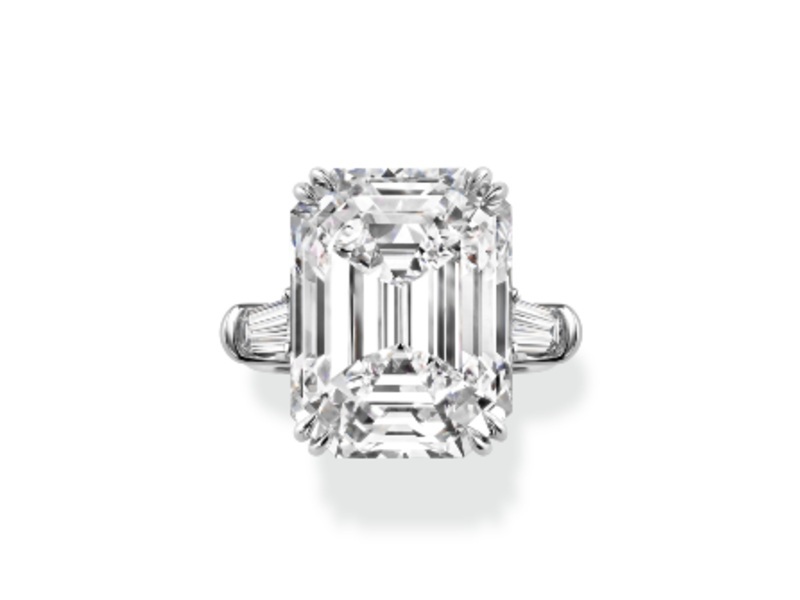 The Tryst ring from Harry Winston. If you prefer your engagement bling to have gemstones like emeralds instead, fabled French jewellery house Cartier also has beautiful propositions like the 1895 Solitaire Ring in platinum, emerald and diamonds. Cartier 1895 Solitaire Ring in platinum, emerald and diamonds. 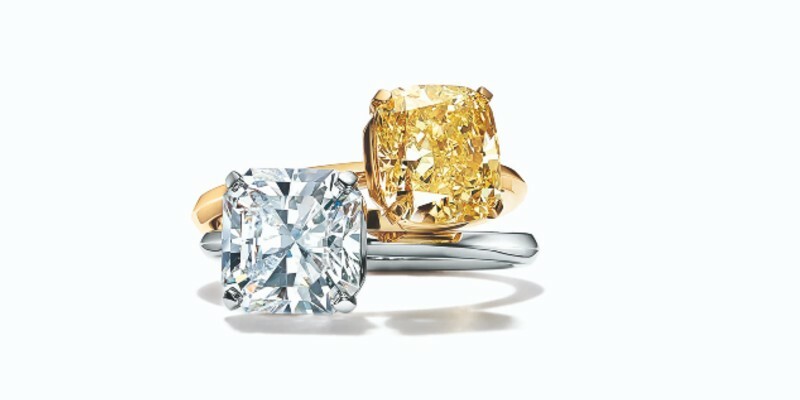 Tiffany and Co. Tiffany True rings in platinum with a white True cut diamond and 18k yellow gold with a Fancy yellow cushion modified brilliant diamond. While princess, radiant and emerald cut diamonds may not appeal to all women, they are undoubtedly elegant and modern options that still manage to hold a certain classic cachet.